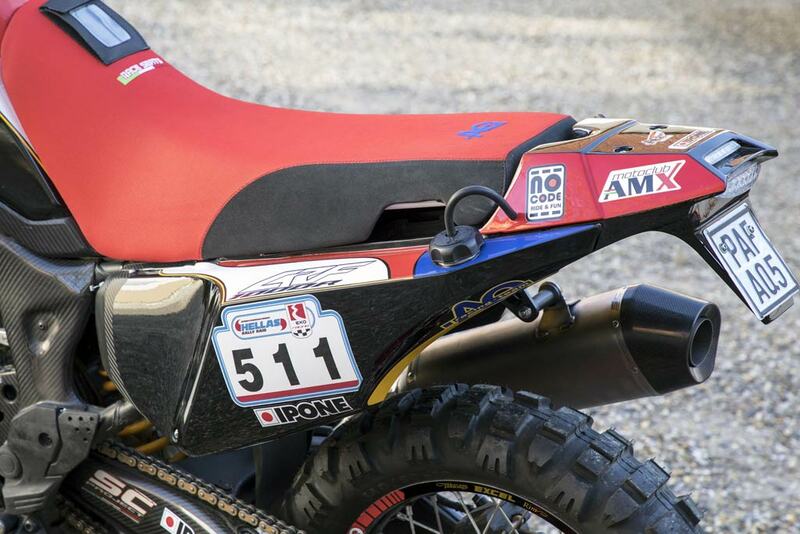  Honda Africa Twin gets converted into big-bore rally machine. The original 1988 XRV650 Africa Twin was conceived by Honda as a no-compromise, race replica based on their Dakar Rally Bike. The NXR750 won the Dakar Rally in its debut year and went on to capture four consecutive titles from 1986 to 1989. Road-going, big-bore ‘Paris-Dakar Replicas’ were all the rage in the late 80s and early 90s. In those days, you could ride a bike off the showroom floor (overseas at least) that was pretty similar to what your Dakar Rally heroes were racing. Those days of the big-bore Dakar Rally bikes blazing at 150 mph across dry lake beds are long over with safety restrictions now limiting motorcycles to a mere 450cc. But that hasn’t stopped German aftermarket parts maker, African Queens, from creating a Dakar Rally-worthy transformation of the twin-cylinder 1000cc Africa Twin. 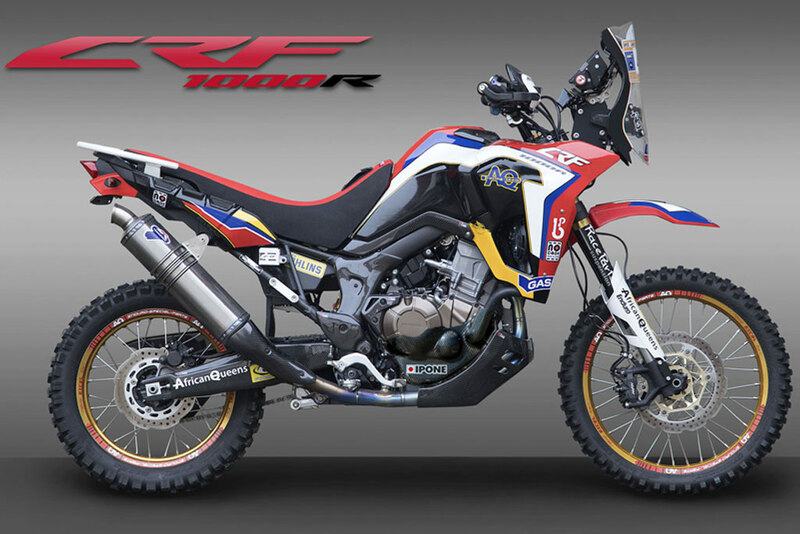 With their new CRF1000R kit, you can transform your Africa Twin into a modern-day, big-bore Dakar Rally Replica. Fairing kit features PiAA LED headlights, ABS clear plastic fairing, side panels and a full rally navigation tower. Total fuel range can be increased to 8 gallons with 2 x 1.5 gallon rear fuel tanks. The African Queens CRF1000R Africa Twin kit was inspired by the Honda CRF450 Rally that currently competes in the Dakar Rally and has been extensively tested in several international rally races. The conversion kit takes your stock AT from mild-mannered adventure tourer to a rally machine with a number of bolt-on replacement pieces. With the full kit installed, your Africa Twin is visually and technically a race-prepped rally bike ready to compete in a growing number of Rally Raids that now allow large-displacement adventure bikes. The kit is made up of a combination of parts that can be purchased separately as needed. 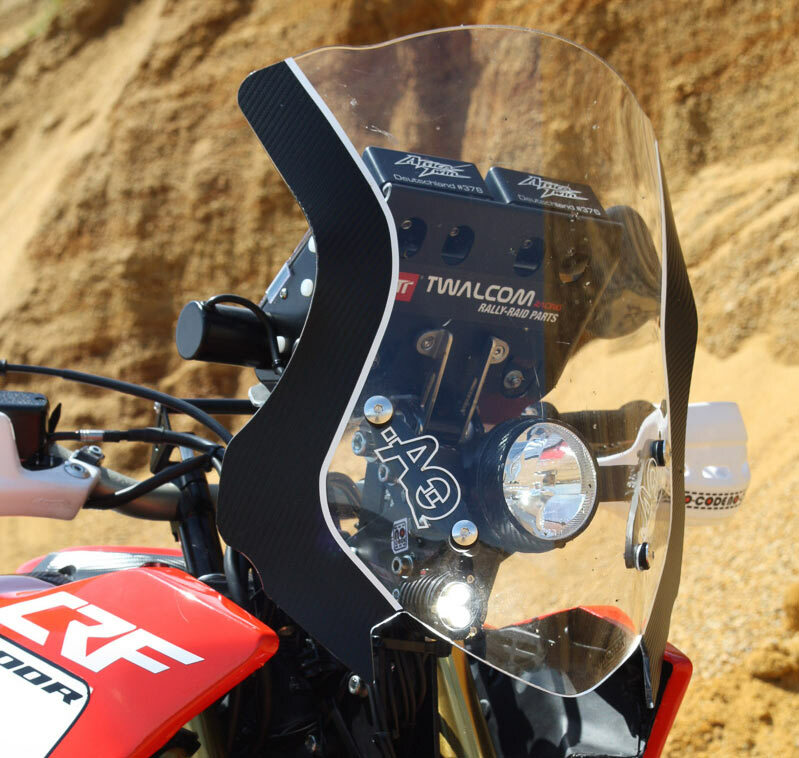 The fairing kit is the core of the CRF1000R Africa Twin, which is made up of an ABS clear plastic fairing, side panels, PiAA LED headlights and a full rally navigation tower that can be fitted with a rally roadbook or the original instrument cluster. Termignoni exhaust system drops 4.4 pounds (2kg) off the bike while adding horsepower. 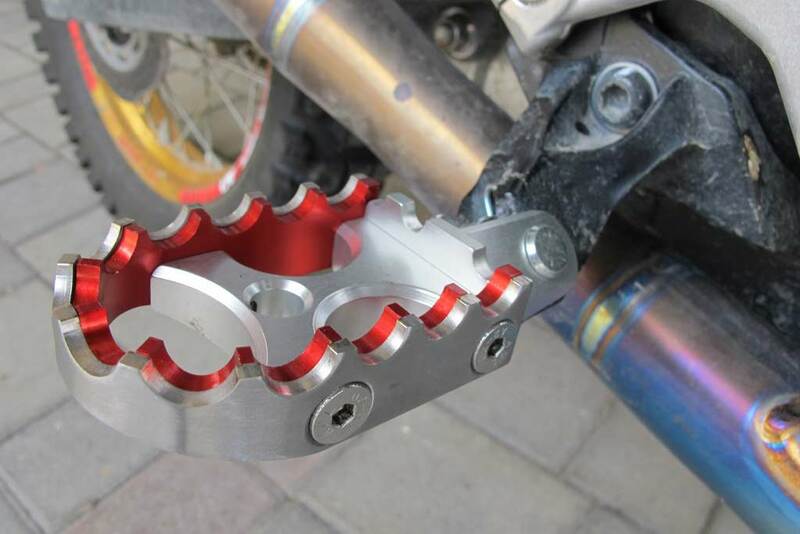 Fork drop-in cartridge improves damping and increases travel. 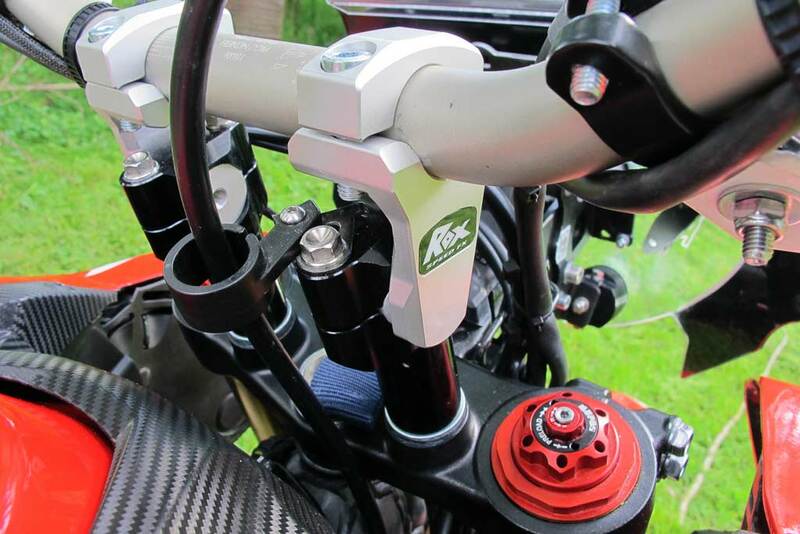 Another major upgrade is applied to the suspension, which consists of a drop-in kit for the fork and Öhlins rear shock. The up-spec suspension components increase travel in the front fork and improve damping for rough terrain. Along with the fairing kit, there are a number of parts aimed at reducing weight of the Africa Twin. 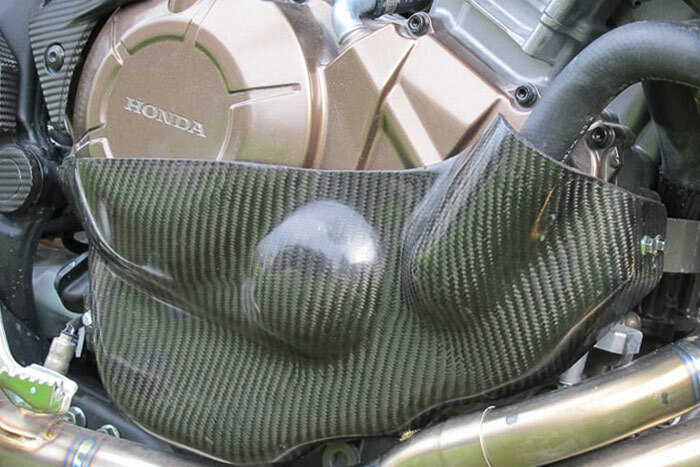 Many of these weight-saving components are made of carbon-fiber, but there is also a rally-style stainless steel Termignoni exhaust system that drops 4.4 pounds (2kg) off the bike while adding a few horsepower at the same time. 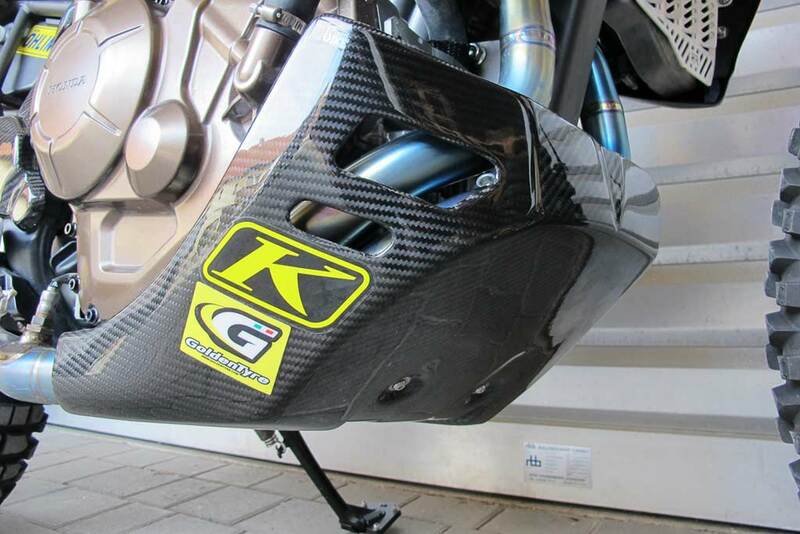 Carbon/kevlar skid plate provides lightweight yet strong engine protection. The kit is rounded out with a range of protectors, beefy Excel wheels, grippy pegs and a one-piece seat, all adding significantly to the durability and off-road performance of the Africa Twin. 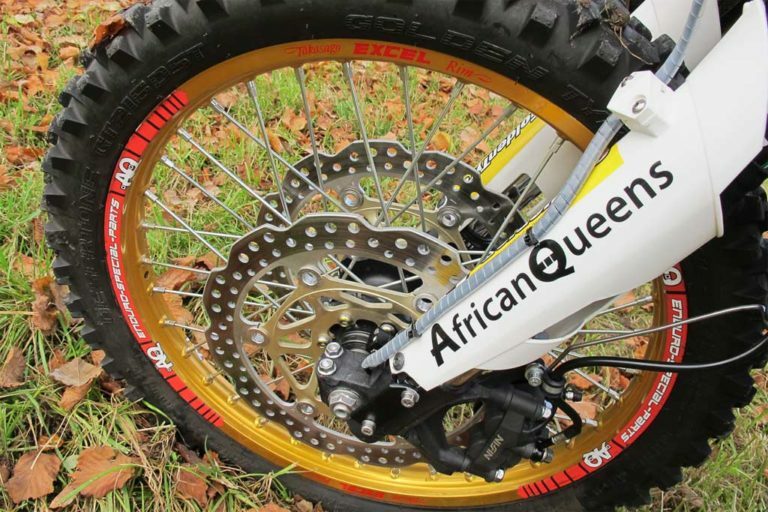 Fully fueled, the African Queens CRF1000R weighs in at 496 pounds (11 pounds less than stock). 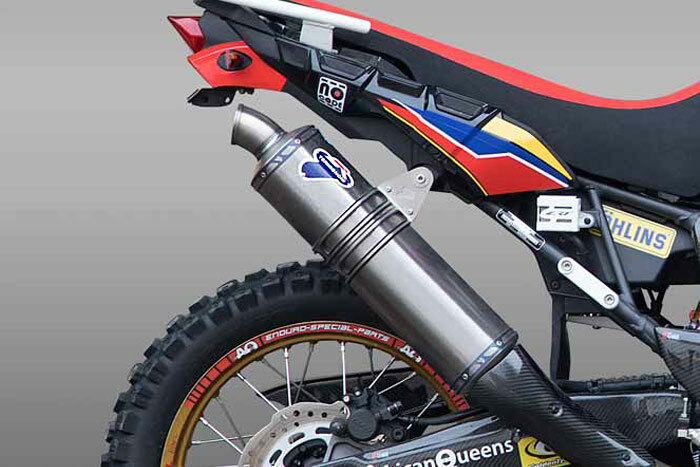 And for those that want additional fuel range, African Queens offer rear fuel tanks that increase the Africa Twin’s capacity from 4.97 gallons (18.8 liters) to 8 gallons (30 liters). Even if your plans don’t include entering in a race anytime soon, you may still want to give your Africa Twin a Rally Raid makeover for the sheer enjoyment of the ride. You can buy the whole CRF1000R conversion kit or select products individually to your own requirements, and African Queens ships internationally. For more details check out the African Queens website. No thanks… I’d just get a KTM 690 that weighs barely more than 300 lbs and walk all over that thing. I agree… but it would be nice to have both. wow, so for only double the price of an Africa Twin I get… an Africa Twin. Or, I could by a KTM 690 and another bike so now I would have two. I just don’t get it. I mean why try to make this heavy bike really ready when you could add all the same parts to a lighter bike and have something you could actually race. This bike is for posers. Poser? Really? Funny. This bike was a stage winner in the Hellas Rally. Hi All. The video in the Africa Twin piece was abysmal. Out-of-focus fade-aways are artsy junk compared to videos/images that actually show the bike and components. Please tell whomever shot that video (and whomever ok’d it for publication), not to waste our time. We want to see the bike and it’s components! ….and a little narration by someone knowledgeable is good too. Thank you. And how about showing somebody really tearing it up. Stupid cheap techno music too. Who are they trying to appeal to, club going mellenials? They don’t wanna work n can’t afford this. Where’s the rally raid conversion for a not so fat/more useable Tiger 800 or GS 800? Everyone’s buying ktm 690’s and all the farkled to go with it, what about the real mid weight competition?